Kuwait lies at the top of the Persian Gulf, bordered on all sides by large and powerful countries, including Saudi Arabia, Iraq and Iran. This small country has large oil reserves, which makes it wealthy and also makes it attractive to neighboring countries. Iraq invaded Kuwait in 1991. A U.S. led coalition entered the country and drove Iraqout. Previously, Turkey had designs on conquering Kuwait. The small country became a British Protectorate from 1899 to 1961. In return for military protection, Kuwait allowed Great Britain to handle its foreign affairs. Today, Kuwait is ruled by the Sabah family and Sheikh Sabah, although the country also has an elected parliament. Visit the BBC to learn more about Kuwait. Question: What are the main industries in Kuwait? 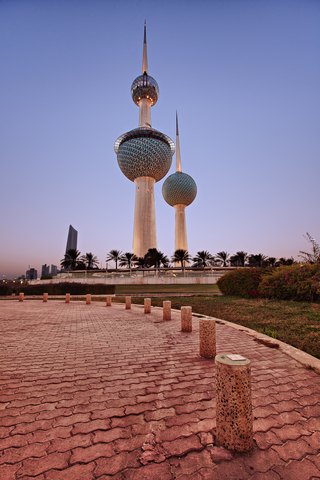 Answer: Like many Arab countries, Kuwait has a hot, dry climate. The main export is oil. Pearl fishing has been an important industry for hundreds of years. Declan, Tobin. " Fun Kuwait facts for kids ." Easy Science for Kids, Apr 2019. Web. 24 Apr 2019. < https://easyscienceforkids.com/kuwait/ >.